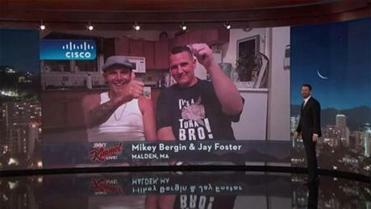 Malden fishermen Michael Bergin and Jason Foster appeared on “Jimmy Kimmel Live!” Tuesday evening. Now it’s time to talk business. Bergin-themed T-shirts? Already printed and selling to fans as far away as Hawaii. A reality show? His sister-turned-agent, Leanne Bergin, said producers have been calling. A licensing agreement with a Hollywood media company that specializes in monetizing popular online content? Signed and generating revenue with every click. Michael Bergin and Jason Foster recorded the now-viral, obscenity-laced reaction to encountering a sunfish in Boston Harbor. Yes, in the age of cat memes, monetizing viral videos is big business. Michael Bergin has licensed his video to Jukin Media Inc. , a Los Angeles firm that will charge media outlets and advertisers — basically anyone who might want to use the footage — for the rights. The firm takes its cut, then pays Bergin royalties, though neither side disclosed financial terms. Jukin also reposted the video on its YouTube channel and is selling ads alongside it. The strategy — all of it, from the T-shirts to monetizing the viral video — is part of the fast-developing plan by Bergin’s camp to turn clickbait into lasting fame and fortune. While most Internet stars shine for an instant, then fizzle out, some manage to profit from their sudden prominence. Pop singer Justin Bieber parlayed YouTube videos into a record deal at age 13. Supermodel Kate Upton vaulted onto the cover of the Sports Illustrated swimsuit issue after a video of her dancing in the stands at a Clippers basketball game ricocheted all over the webisphere. It’s unclear whether Bergin possesses the kind of talent needed to sustain long-term success, but his deal with Jukin is one way to bank a few bucks in the meantime. The company has built a library of more than 20,000 videos since it was founded in 2009, creating a digital marketplace for homemade clips. Most yield from a few hundred to a few thousand dollars for their creators, according to Jukin. It’s not much, but even a small sum is more than an amateur videographer could otherwise expect from sharing it on social media. And it’s a surer bet than an old-school submission to “America’s Funniest Home Videos.” Just a few years back, that was one of the only ways to profit from home footage. 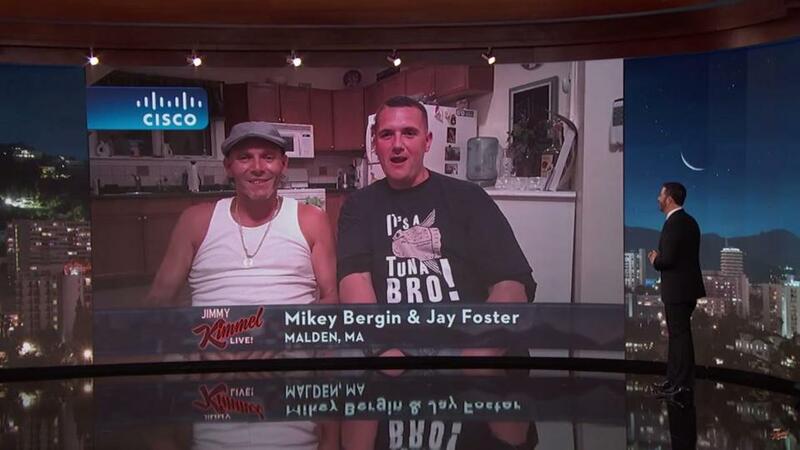 The T-shirts offer another immediate source of income for Bergin and got generous exposure on the Kimmel show, where he was joined by longtime friend and fishing pal Jason Foster, who sported a navy blue tee that read, “It’s a tuna, bro!” — one of several memorable phrases a delirious Bergin shouted in the viral video. Foster was driving the boat from which Bergin spotted the sunfish, a creature he mistook for a baby whale and even a sea monster while filming the episode. His heavy Boston accent and unbridled enthusiasm made the video an overnight sensation. For $21.99, T-shirt fans can also wear “It’s a sea monstah!” “Call the aquarium!” or “It’s a baby whale, man!” across their chests. The shirts are being sold online by Chowdaheadz LLC, a Waltham apparel maker known for Boston-themed tees. Leanne Bergin, a sales representative at Greater Media Inc. in Boston, has sold ads to Chowdaheadz and said she has known chief executive Ryan Gormady for years. They struck a deal in which Michael Bergin licensed his catch phrases to Chowdaheadz in exchange for a cut of every shirt sold. Both sides declined to reveal financial terms Wednesday. Gormady wouldn’t say how many shirts have sold since they were released Monday afternoon, but said orders have come from all over the country. “I don’t know where this will go. It’s probably his 15 minutes of fame, not 15 years, but you’ve got to strike while the iron is hot,” Gormady said. Leanne Bergin said that when her brother’s video took off, she sensed that others would attempt to profit from it and resolved to help raise his profile while protecting his interests. Though she granted an interview for this story, Michael Bergin did not respond to multiple requests for comment. Leanne submitted the footage to Kimmel. She also consulted attorneys about the prospect of trademarking the phrases now printed on T-shirts. The consensus, she said, was that it wouldn’t be worth the trouble, since the filing process for each slogan would cost about $700 and take a year to complete. Patent lawyers who reviewed the projected cost and timeline at the Globe’s request concurred. As for a reality show, Leanne Bergin said one concept floated by a producer involves flying her brother around the world and capturing on camera his presumably hilarious reaction to other strange sights. One production company even reached out to the Globe Tuesday, hoping the newspaper would introduce it to Michael Bergin and Foster. “We’re always on the lookout for fresh, buzzy stories and talent, and just like everyone else across the Internet, we’re very entertained by Michael and Jason,” a company representative wrote in an e-mail. No word on how the sunfish is doing, or whether it might land any commercial deals of its own.